Rule #1: We do not talk about being lonely. Rule #2: We DO NOT talk about being lonely. This strict code is not without reason or rationale, considering the mere mention of Black women and loneliness has the ability to set a thousand pathologizing think pieces sailing across the digital waters of Facebook and Twitter timelines. Don’t be overheard saying you are lonely lest you want everyone from Oprah to your best friend, who just watched The Secret last week (15 years after it came out), to appear floating above your bed to tell you it’s because your negative inner chatter is blocking your chances at partnership. The latest self-love guru will tell you it’s because you obviously do not love yourself enough. Black men on Twitter will tell you it’s because you’re thirsty, a THOT, stuck up, stupid, or a petty, bitter Black feminist. To be Black, female, and lonely is to be at fault. Loneliness is not a translation of the word desperation. It’s Christmas Eve, and I am hanging up freshly washed laundry in my well-appointed home. My Yorkie is curled up on the couch and I have decided to brave Christmas carols for the first time this season. I turn on Spotify and brace myself. I used to love Christmas music, but since my mother died four years ago at the tender age of 53 (the medical examiner said she died of a broken heart, aka Black Woman Loneliness), holiday songs have become gifts wrapped in razor wire. It was fine at the start, me slinging sweaters over pink felt hangers while Bing Crosby crooned in the background about white Christmases. Loneliness, however, is a swift moss. A few notes in and I was a forest floor of sadness and longing. I couldn’t name it at first and then it crystallized: here I was having an extraordinarily ordinary day. If not for the song lilting through my speakers and the ceramic Santa perched jovially on my end table, there would not be a single indication that tomorrow was a holiday. I was home alone on Christmas Eve doing laundry and suddenly soul-struck with an unspeakable loneliness. Of course, it is unspeakable. I mean, who am I to complain? I am an entrepreneur whose job takes her all over the world. I have expendable income and no mouths to feed, save the 6-pound Yorkie on my sofa. By all accounts I am living the dream. And guess what? I am. And I am here to break the rules and admit that “the dream” does not cure loneliness. In some ways, it intensifies it. I can hear the well-meaning retort now: “Sonya, you just need to build meaningful friendships.” I appreciate your perspective, but let’s be clear, I have more friends than I can manage. My life is not lacking deep, emotionally vulnerable relationships. I have made an art of building community and filling my life with rich, verdant, available people with whom I share intimacy and love... and I am still lonely. All loneliness is not a state of lack. Some loneliness can only be characterized as an ache of overflow. It is the result of having filled one’s life with so much grace and beauty that it would be evidence of a selfishness only grown out of isolation and greed to feel no desire to give away such bounty, to share. Loneliness is not the manifestation of a self-love deficit. I am not failing because I am lonely. I am lonely because I am a human bound to the same desires as most humans: care, companionship, communication, and someone else to wash the damn dishes when I don’t feel like it. Loneliness, however, is a swift moss. A few notes in and I was a forest floor of sadness and longing. Writing my new book, The Body Is Not an Apology: The Power of Radical Self-Love, was one of the loneliest tasks I have undertaken. It illuminated the ways in which loneliness is a coat of a million distinct threads. There are varying textures to the labor of being lonesome; the longing for someone to share the sumptuous meal I just prepared is a different shade of lonely than the ache for a deep, passionate kiss. This hue is distinct from the loneliness of seeing a beautiful sight and becoming aware that you have no one beside you to also behold it. One of the tenets of developing a radical self-love practice is learning to make peace with not understanding. Loneliness is presented as a function of personal ineptitude, because if we do not blame ourselves, we are left sitting with the chilling reality of wondering whether the chasm of loneliness will ever be filled, which in a great many ways is purely an exercise of chance. If I am just doing “it” wrong (whatever "it" is), I can fix the wrong and ensure that eventually the universe will bless me with a helpmate on this life journey. The truth is I don’t know that. I could do everything right and still be lonely. And so much of what we understand about being lonely is constructed through a cultural prism that values partnership over singleness, to the extent of pathologizing the single. All of these dynamics and messages exist to evade the reality that a whole heap of the equation of romantic relationships is out of our control and none of us can understand how, when, or if it will happen for us. There are times when the reality of how out of control this specific portion of my life is feels devastatingly painful. There are times when the thought of continuing to have this life brimming with possibility and magic and having no life partner to lay down and wake up beside breaks my heart in real time. And yet, loneliness is not a translation of the word desperation. I am not willing to exchange my dignity for an end to my loneliness. I am unwilling to barter my self-respect for the absolution of loneliness. Today, I love me in a way that won’t let me settle for anything less than someone who loves me just as much. This commitment to myself does not make the lonely subside, but it does make the love I have for myself radical; and at least for today, that radical love is enough. 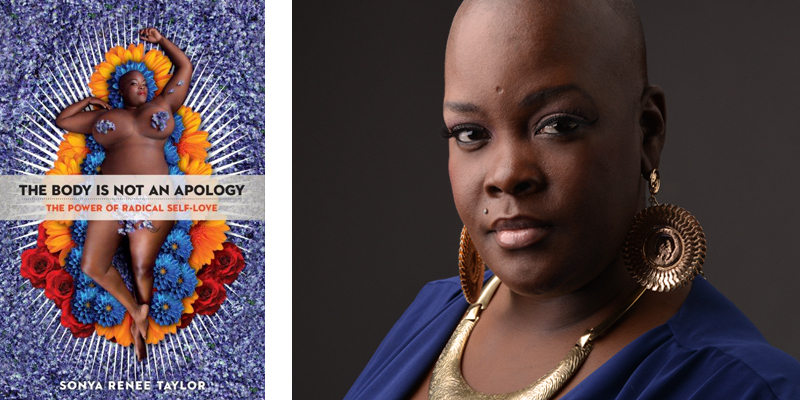 Sonya Renee Taylor is the Founder and Radical Executive Officer of The Body Is Not An Apology, a digital media and education company committed to radical self-love and body empowerment as the foundational tool for social justice and global transformation. TBINAA.com reaches over 1 million people each month in 140 countries with their articles and content focused on the intersection of bodies, personal transformation, and social justice. Sonya is also an internationally award-winning performance poet, activist, speaker, and transformational leader whose work continues to have global reach. She has appeared across the US, New Zealand, Australia, England, Scotland, Sweden, Germany, Brazil, Canada and the Netherlands. Sonya and her work has been seen, heard and read on HBO, BET, MTV, TV One, NPR, PBS, CNN, Oxygen Network, The New York Times, New York magazine, MSNBC.com, Today.com, Huffington Post, Vogue Australia, Shape.com, Ms. Magazine, and many more. In 2016, she was invited by the Obama White House to speak on the intersection of LGBTQIAA and disability issues. She has shared stages with such luminaries as Carrie Mae Weems, Theaster Gates, Harry Belafonte, Dr. Cornell West, Hilary Rodham Clinton, the late Amiri Baraka, and numerous others. The Body Is Not an Apology: The Power of Radical Self-Love is her first book. 2 Responses to "The Secret Cult of Loneliness"
I am a middle-aged white divorced woman. I am FULL. I have a lovely, love-full career I have built from my bare hands in the last few years since the divorce. I have 2 almost adult kids. A dog. A house. I cook wonderful dinners, have some precious pieces of artwork that give me joy, in the "kid finds a rock she thinks must be a diamond" and takes it home and pulls it out sometimes to marvel in the amazingness of holding her very. own. diamond. Like a dragon. But recently, I felt a lack. The ONE thing I can't do for myself is to feel myself being cherished by someone else. I can do it ALL except that. I can hire someone to do my taxes, I can get my house cleaned, my shopping done. But I can't self-create being cherished by somebody else. That is a hard, lonely lesson. I cannot wait to read this book! So many people are living with this same anguish for most of their lives. We need to become more kind and gentle with each other in order to keep sensitive souls from giving up so that they fall by the wayside. By loving and accepting ourselves we learn to love, help and accept others.